We still need to get candy for the trick or treaters… at least Halloween is on a Saturday this year. 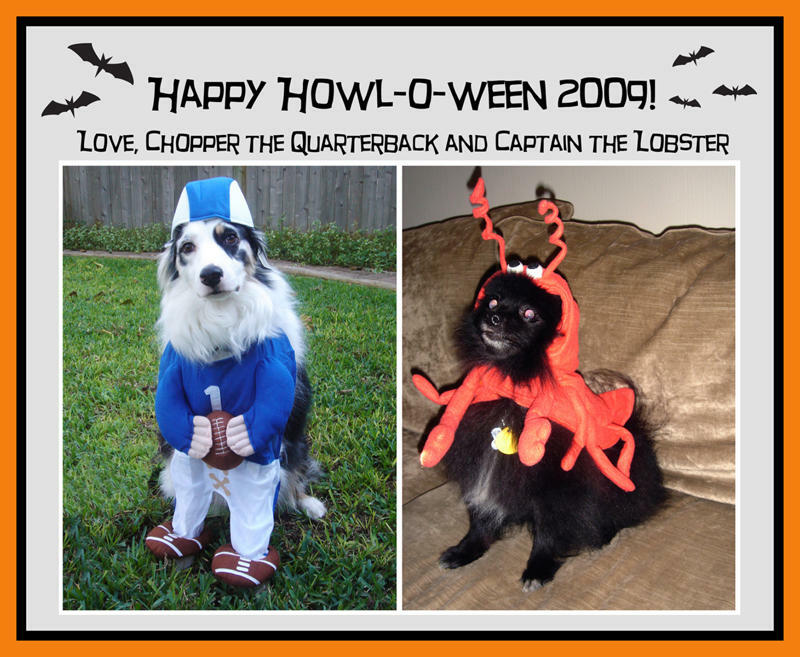 Many thanks to My Pal Al for making this post so easy for me (and for dressing up the pups – Ruby is jealous! Well, not really…)! More next week on the craftiness that I have been up to… have a great, safe weekend! At home before thefootball game, after borrowing clothes from Yarbs b/c it was COLD!!! I LOVED going to the game and seeing all the huge mums (they are fake now) with all the stuff streaming off of them. Great seeing Breedlove (my old track coach) and some of my fellow grads. I realize I didn’t take many photos, just wasn’t feeling it. Then Mom’s and Dad’s friends threw Boom and I a couples baby shower – it is so great – they have all been friends for 20+ years! I think they just love any excuse to get together. So glad that My Pal Al and Tiff were able to attend. Al literally had just gotten in from KC! Tiff just had a baby boy a few months ago – adorable! and she seemed happier than I can remember! so that is so awesome. Can you tell we are so excited for Cash Money?! I know we are in the final stretch – and I just can’t wait to meet him! Will make all the blahs of pregnancy well worth it. With my best gal, Yarbs. You can’t tell, since she looks so cute, but she is not feeling well. Probably had a case of the H1N1. She has a ton more pics from the shower, so I just need to get them from her once she is back in the state. Work has been crazy busy as well. The season opened on Oct. 23, so lots of events and prep leading up. Opening night was a huge success! Really glad I got to see, albeit briefly, El and K. They looked so great! Love K’s new haircut – and got to see their sig others – it has been a long time! And everyone is being really sweet with baby gifts for CM. I’ve been busy making lots of stuff for him and his room… more on that to come! Everyday, I seem to get bigger and rounder! I can’t do anything about it, but I do worry about post-bebe… losing all this weight will be lots of fun (ugh). I am looking forward to being able to run again – and for as long as I want / can! Our red mid-century modern Eames rocker! I love love love it! And it is really comfortable. Boom’s mom and 2 sisters bought this little gem for us. Our crib! Isn’t is just too too cute?! I love the gray – that is the color we based our wall color on (lighter) and frames (same exact color). Our super adorable bassinet! Yarbs and Joe very generously got this gift for us. It is so so cute! and looks good (actually looks good!) where ever it is. Our activity gym (and mobile) fits on top of it – to make it even even cuter! Our Dwell Studio swing! I couldn’t find a swing that wasn’t a lot of plastic, so this was the best of what is available. and it is really cute. My cousin, T, and his wife, S, were really kind to send this to us! Their baby, Z, will be about 1 year older than Cash Money – which is the same distance as T and I. I am excited that CM will have a cousin close in age! Hopefully we’ll be able to get them together soon after he is born, and often. Update: I’ve decided to get off the cr@ck and just buy him a crib bumper and crib set. Last night when I was working on the bumper, I realized it was not turning out exactly like I wanted, that the fabric was not quite right, and that I didn’t want to be spending so much time making a bumper. I will likely turn it into a quilt of sorts. Now I am on the quest to find the crib set that is just right for Cash Money! Wish me luck! Oh-Oh the Owl (Many thanks to One Red Robin for the pattern!) And what could be better than one Oh-Oh the Owl? How about two?! I think I made their heads too large, but they came out well. I think I liked this plushie tutorial because the finished product is large enough to not have to hand stitch (the ban of my existence – I won’t do it!). Next time I will use a thicker body fabric – other than that, these were quick to make and easy! I like to make things in 2, as it doesn’t take twice as long to do, but in the end you have double! I should have mixed up the felt a little bit, so that they are not exactly the same, but oh well. Boom likes how sleepy they look. I want to give one as a gift, but Boom wants me to keep both for Cash Money. Why he needs to owls that are exactly the same is beyond me 😉 He never wants me to give my handicrafts as gifts, though – I think because he knows how much time I spend on them, he wants them to be appropriately appreciated. Which is sweet of him. Haven’t had time to craft (or blog) recently, but hopefully things will settle down before CM arrives and I can do both, as after he comes, all bets are off! I was out during my lunch break last week and was able to do a little thrifting – it was quite a nice experience, compared to when I go on Saturdays. I guess on Saturdays it is just so packed. A shorter, wider hobnail milk glass vase. I didn’t have this shape yet, so glad that I was able to snag it. A vintage depression glass cup and saucer – with the same exact pattern as the plates that I had bought earlier! Not hobnail, but totally loved the shape – it is adorable! And it was on “sale” – the thrift store where I get these things will put dates on the price tag that decrease with the amount of time they are out on the store floor. So I got this little treasure for just $1! I wanted to put it on my windowsill to put my rings when I wash the dishes, but it is a bit too big to fit on the sill. Regardless, I am sure I will find a good home for it, and I really just love it! We finally got our rug that we ordered 9 weeks ago (we had ordered the crib then as well, but when it came it, it was damaged!!! GRRR) from a store that will remain un-named. The rug is super cute! I love it – it is a Dash and Albert – matches the old couch perfectly. Well, with all the colors, it would match a lot of stuff. Really makes the landing seem much more finished – just need to get a TV and we’ll really be in business! Eventually I would like to get an oval coffee table (and we’ll use that sturdy rectangular coffee table as a bench in one of the bedrooms – I’ll make a cushion for it at that point) and some more seating, but it is a marathon, not a sprint. I think some floor cushions would also be good. I think S (designer / friend) would like to have a window seat made eventually. Lots of space up front to play with lil’ Cash Money and his toys!